I'll take illustrated notes while you talk. It's fun to watch, and you get to keep the work when it's done!! Graphic recording is an innovative way of creating interest and engagement at just about any kind of event. It caters to different learning approaches, and fosters creative and often unexpected feedback and collaborations. The visual record creates a "collective memory" of the event and promotes validation among project participants. Details from the graphic recording can also give life to the material long after the event. The images can be used to make print and web documents more vivid and accessible. There are graphic recorders and graphic facilitators all over the world! To learn more, check out the International Forum of Visual Practitioners website. You might also like this excellent "quick guide to graphic recording" posted by world-class practitioners ImageThink. As a visual practitioner based in Calgary, Canada, I've developed my own brand of graphic recording, informed by my own particular skill set, as well as the needs of Alberta organizations. If you're interested in my own practice, I can point you towards this video, created as a school project by SAIT photojournalism student River Cha. River had to make a three-minute documentary, and she picked graphic recording as her subject! Being featured in her short film was a treat for me. I'm looking forward to seeing what she creates next! 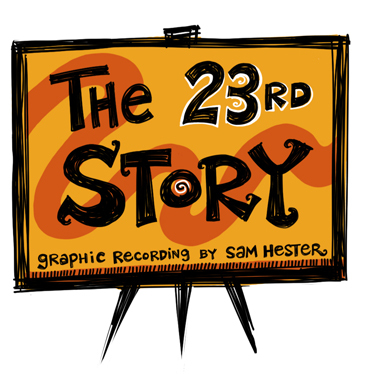 The 23rd Story from River Yeeun Cha on Vimeo. To see more examples of my work, you can take a look at my photo gallery. Some work gets posted on my blog, and some on Twitter. You can find out more about me and my Calgary-based practice here. Or, please contact me and I will be sure to get in touch with you.